Funeral Mass will be celebrated at St. Maria Goretti Catholic Church, 5313 Flad Ave., Madison, at 11:00 AM. 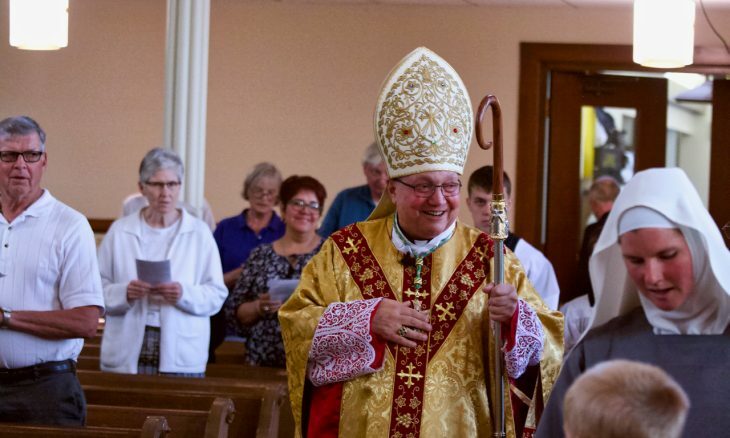 The Most Reverend Jerome Listecki, Archbishop of Milwaukee, will be the principal celebrant with the Reverend Monsignor James R. Bartylla as homilist. EWTN will broadcast Bishop Morlino’s funeral at 11am on Tuesday, December 4. Funeral Mass will be live-streamed at the Auditorium at Holy Name Heights. All are welcome. The interment will be at Resurrection Cemetery immediately following the Funeral Mass. Following the funeral, a luncheon reception will be held at the Marriott West Hotel, 1313 John Q Hammons Drive, Middleton. A PDF with the funeral details can be read and downloaded here.